Two portions of the cake batter were flavored with another nostalgic dessert, J-E-L-L-O! Using 3-ounce packages of cherry and blue raspberry Jello was the quickest and easiest way to get the sweet-tart flavor of the original ice pop into the cake. To achieve a colorless lime layer, I added LorAnn lime flavoring oil to the white cake batter. I was happy that all the flavors came through so well in the finished cake. Sometimes extracts and other flavorings will dissipate in the oven under heat, but the flavors of cherry, lime and raspberry were nice and robust! 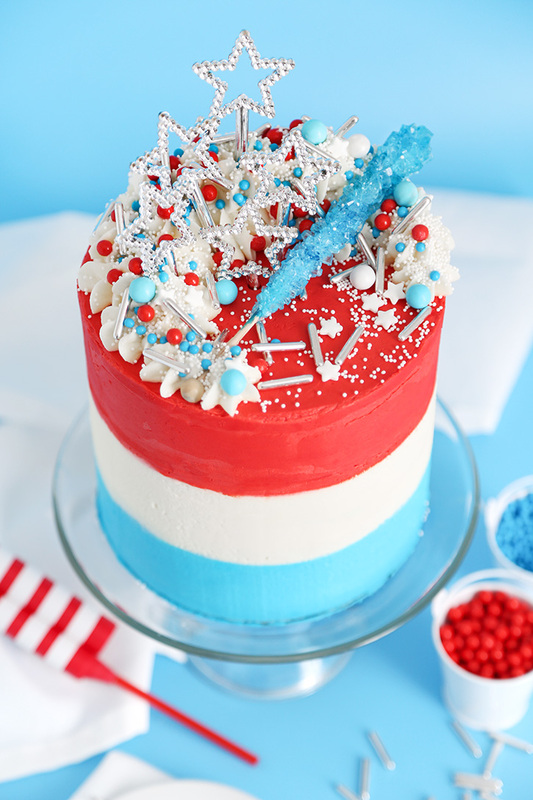 I garnished the cake with all sizes and shapes of sprinkles; white nonpareils, white confetti stars, silver rod dragees, assorted beads and Sixlets. I also added a glittering rock candy lolly pop on top. The silver star decors are actually fairy wand toys, but I couldn't resist using them as cake toppers. 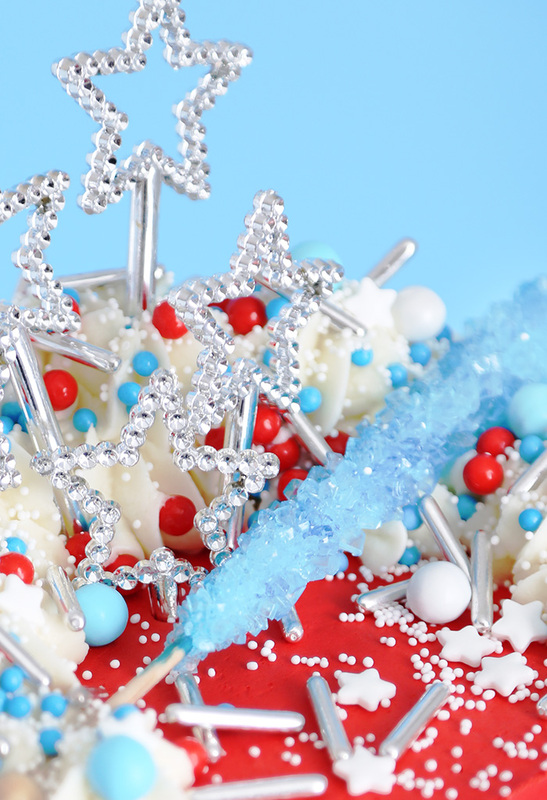 They added the perfect amount of sparkle and made this a genuinely star-spangled confection. 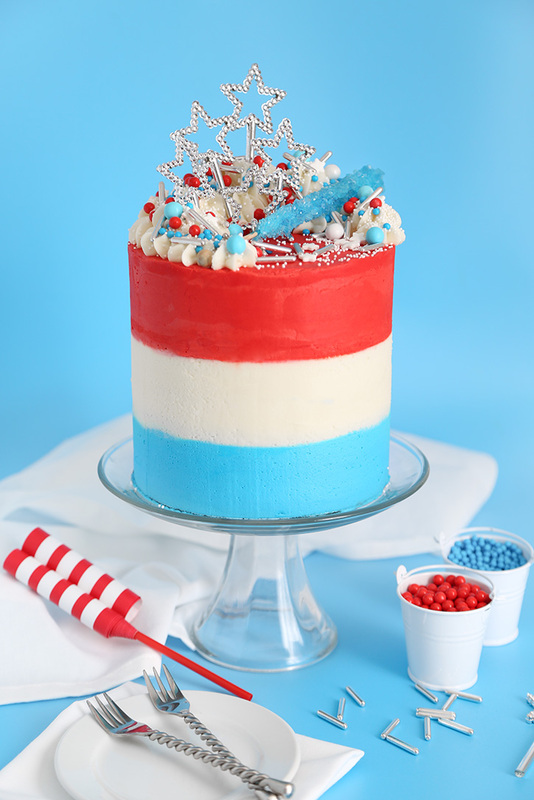 This cake is red, white, and blue all the way through! I baked the layers in three 6x2-inch round pans, which makes a tall cake. I'm a big fan of these little cake pans because you can take almost any 9-inch double layer cake recipe and turn it into a triple layer cake. If you're looking for a good set, I use and recommend three of these. Slices of this cake are wonderful with scoops of vanilla ice cream on top. 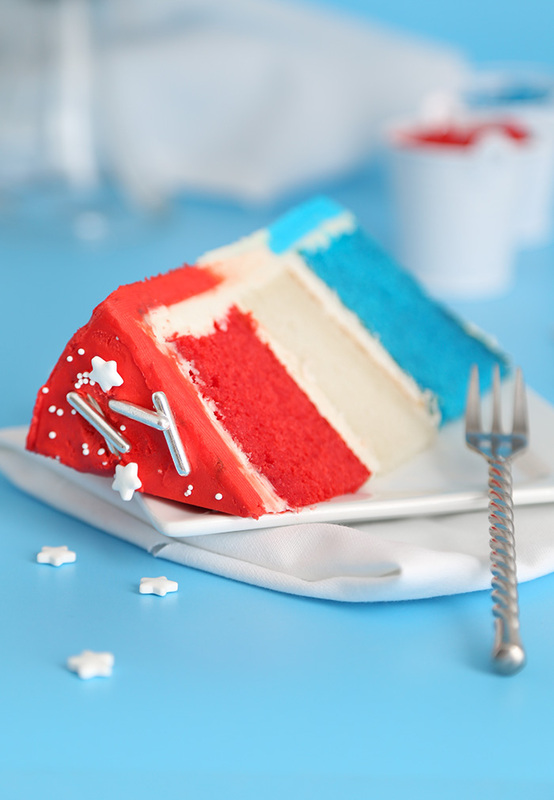 It's a great way to celebrate summer, and I could see this as an eye-catching dessert for July 4th! Preheat oven to 350°F. Coat three 6x2-inch round cake pans with flour-based baking spray. Sift together the flour, baking powder and salt. In a separate bowl, whisk together the egg whites and milk. In the bowl of an electric mixer fitted with the paddle attachment, beat the butter until creamy. Add sugar and beat until fluffy. Scrape down the bowl as needed. Add flour mixture alternately with the egg white/milk mixture. Begin and end with the flour mixture. Beat until smooth on medium-low speed after each addition. Divide batter evenly into three bowls. This will be about 1 2/3 cups of batter per bowl. Divide boiling water into three separate small bowls (1/4 cup each bowl). Stir the cherry, raspberry, and unflavored gelatin in each of the three bowls (gelatin may not totally dissolve – this is okay). Add the lime oil to the bowl with the unflavored gelatin and stir well. Stir the cherry gelatin into one bowl of cake batter and add the red food color. Fold until well combined. Stir the berry blue gelatin into another bowl of batter and add the sky blue food color. Fold until well combined. Add the lime flavored gelatin to the last bowl of batter and fold until well combined. Pour each batter into a prepared 6-inch pan about 3/4 full. Bake for 35-40 minutes, or until cakes are firm and a toothpick tester inserted near the center comes out clean or with a few moist crumbs attached. Remove cakes from pans and allow to cool completely. Level cakes if needed. The blue and red layers will not crown much. The white layer may puff a little taller than the other two, so it will need to be leveled. In the bowl of an electric mixer fitted with the whip attachment, beat the butter until creamy. Add the confectioners’ sugar and salt. Mix until thick and crumbly. Add milk or cream a little at a time until the mixture is thin and begins to whip into fluffy frosting. You may need to use more or less milk depending on the cornstarch content in your confectioners’ sugar. Beat in the vanilla extract. Beat frosting on high for 3-4 minutes, or until the frosting loses its yellow color and turns almost white. 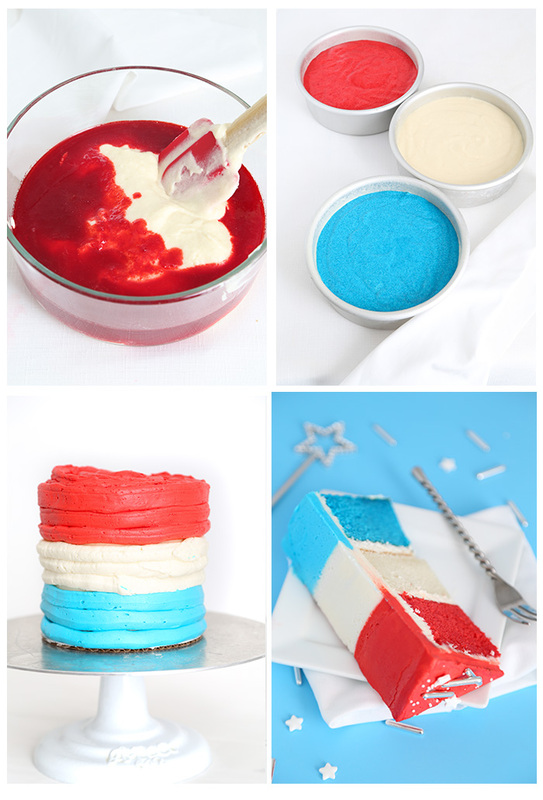 Spread a small amount of frosting on the blue cake layer, and place it on a cake board or cake stand. Top the blue layer with the white layer. Spread a small amount of frosting on the white layer and top with the red layer. Frost entire cake with a thin coat of buttercream (crumb coat). Refrigerate until firm. Divide the remaining buttercream into three portions. Tint two portions with the red food color and blue food color. Leave one portion without color. Transfer each color of buttercream to disposable piping bags with 1/2-inch hole cut in the ends. Pipe three fat lines of blue buttercream on the bottom third of the cake. Pipe three fat lines of white buttercream just above the blue so that 2/3 of the cake is now covered. Pipe the remaining 1/3 side of the cake with the red buttercream, and then pipe it onto the top of the cake. Use a cake smoother or bench scraper to smooth the sides of the cake, removing some of the frosting so that the colors meld together. Smooth the top of the cake with an offset spatula. Pipe more white frosting on top of the cake and garnish with assorted sprinkles. Store cake under plastic wrap at room temperature. Those are my favorite popsicles. I love the play on them in cake form! Looks so delicious! Perfect for 4th of July! Absolutely love how fun this cake is! Rocket pops are pure childhood :) I’ve only ever seen Jello poke cakes—delicious in their own homey way, but this is on an entirely new level! So adorable! I’ve only ever had/made those delicious Jell-o poke cakes. This is a whole new level to aspire to in my kitchen! I have no words to complement you. This cake looks so amazing and tasty as well. I am definitely gonna try this. Thanks.